One of the exciting new voices in Italian-Canadian writing is Gianna Patriarca. Her first book of poems, Italian Women and Other Tragedies (1994) made a significant impact on many readers who could readily identify with her very accessible poetic lines. Her acute observations on the human condition and on ordinary immigrants make her book, Daughters for Sale (1997) very popular. Gianna Patriarca was born in Ceprano, Frosinone, Italy, and emigrated to Canada in l960 as a child. She received a B.A. in English Literature and Italian and a B.Ed. both from York University and presently teaches for the Toronto Catholic District School Board. Gianna’s poetry has been widely anthologized, her poems have appeared in many journals and magazines. Her poems have been heard on CBC, C.I.U.T., CHIN radios as well as TV Ontario, Imprint, C.F.M.T. TV and Telelatino. She has been a featured reader at Harbourfront International Reading Series and many universities including Yale and Calumet in the U.S., and Udine and Milan in Italy. Her books appear on the course lists of many Canadian and American universities. Gianna’s poetry has been adapted for the stage in a production called Ciao, Baby. It had a very successful three week run at Canada Stage Berkley Street Theatre in Toronto in 2001 and received many great critical reviews. 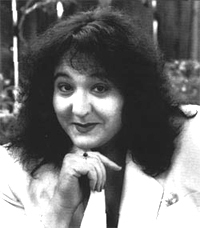 Gianna Patriarca has appeared in the following Film Documentaries: Pier 21, 2001, Telelatino TV, Enigmatico, National Film Board 1997, The Italian-Canadians, 2003, Telelatino TV.